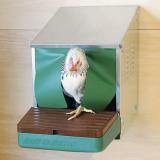 A heavy-duty nesting box with a curtained area to provide privacy for the most timid of hens. 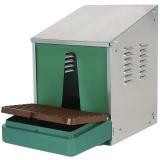 For providing hens a secure place to lay their eggs. Curtained area—provides ample privacy and security. Roll-out tray features an adjustable slope (some eggs roll easier than others). 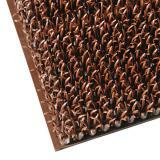 Removable nesting pad is easy to clean. Also reduces bedding needs. Pad is made of polyethylene—not a “home” for bacteria. 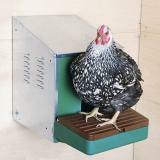 This nest box provides a secure and private area for hens to lay their eggs. 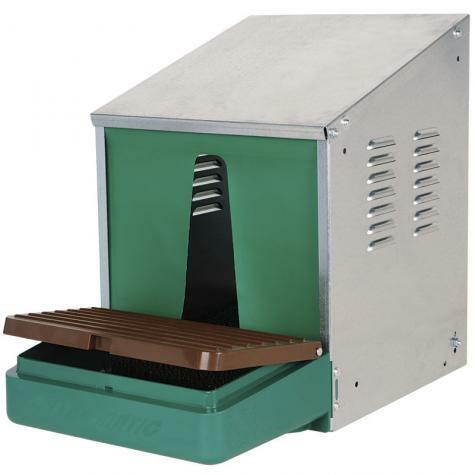 An adjustable roll-out tray prevents hens from overly soiling or eating their eggs. I bought (4) of these, great product. Assembly was fairly easy and didn't take long. My chickens started laying in them the first day after I removed the old nesting boxes. I put a little straw in the nest the first day and then started cleaning a little out daily for a few days until there was no straw at all in the nests. I set the elevation on the center adjustment as recommended, eggs roll away clean and safely out of sight. I haven't installed the privacy curtains yet but plan to a day or so. These boxes have fixed my problem with an unidentified egg eater and has increased cleanliness of the eggs. My only regret is that I didn't purchase these years ago. Received the chicken nest quickly. Easy to put together. Top of the line nest and are working out great. Would highly recommend these to anyone. Great company. Delivery was prompt. Packages intact. Difficult to follow instructions though. We had a hard-core egg eater, very expensive, breeding hen. Nothing would stop her. So as a last resort, I bought one of these. Our birds are Jersey Giants, and this box is a bit small, but they learned to cram their fluffy butts in. And since then, I have not lost any eggs! Just wish the company would make larger boxes and assembly instructions that weren't like Ikea. Works great and love your quick order shipment. Thanks.